Above Image: The orange Wikispeed SGT01 Roadster: crowd-funded, crowd-designed, crowd-produced, hitting the streets in small batches now for $25k, oh, and it gets 100 miles per gallon. What if I told you the next affordable, long range, fuel efficient vehicle might be assembled in your garage or built by your neighbors? That’s what I was surprised to hear, when I learned about the Wikispeed auto project. Wikispeed is a business that crowd sourced designs, production, development, and has created a SAE registered, road legal approved car the Wikispeed SGT01 Car, now on sale in limited quantities. This case example is part of my ongoing coverage of the collaborative economy, on how the crowd becomes a company. I had the opportunity to meet Joe Justice (pic) of Wikispeed at the Aspen Institute, a center dedicated to the advancement of thinking, our roundtable has been focused on how institutions must innovate in the rapidly changing environment. I’ve shared elements of the Collaborative Economy research, which has been one of the under current themes at the event. 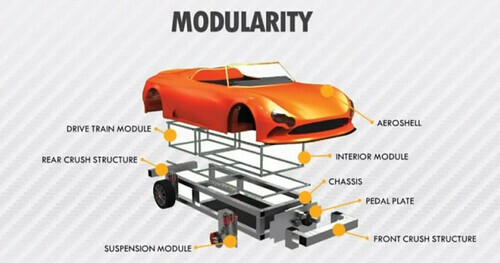 Above: Wikispeed cars boast modularity, where individual components are assembled by crowd and shipped to a buyer’s garage to assemble. A car can quickly become a truck, by removing and replacing body. Like Wikipedia, a global set of experts are People are participating, in various levels of commitment. They’ve crash tested front and side impact tests, and created a suite of impact test simulations to test rapidly. Design was crowdsourced, using Dropbox and Google apps like Groups, Hangout, Talk, Cal, Drive, and more. Production Methodology is “Extreme Manufacturing”, bringing a new iteration of product every week. Like the agile software method deployed by many tech companies, a similar mindset of rapid iteration rather than long term planning has emerged at WikiSpeed. Features: Airconditioning, Radio (but no cup holder), using a Honda engine, but they’ve built the housing so other engines could be used, as a modular component. The car body can be quickly interchanged with a pickup truck body, allowing instant versatility. From my perspective, the disruptions are coming at an accelerated pace, sharing, markers movement, augmented reality are quickly emerging. Companies who don’t adopt the Collaborative Economy are at risk to being disrupted as their own customers start to develop their own products, build new services. A natural reaction of most corporations is to battle these trends with legal, policy, and competitive measures such as deploying fear uncertainty and doubt, or combative marketing and sales measures. As the crowd starts to become like a company, it offers risks and opportunities for all corporations, although I prefer to focus in on opportunities. In a broad stroke, corporations lack flexibility, the ability to customize for individual needs, and struggle at constant innovation. In general terms, the crowd lacks a trusted brand, mass production, an army of customers, resources, and mass distribution. Together, they can create a new resilient organization that negates these weaknesses and that taps best of corporations and the crowd. Companies who want to avoid disruption and benefit from opportunity must follow the Collaborative Economy Value Chain (read the full report), which taps into new models of Company-as-a Service on demand offerings, motivating a marketplace for resell of goods and services, and provide a platform to allow customers to augment and enhance every business function in your company. This was initially posted on Huffington Post, I cross-posted here.